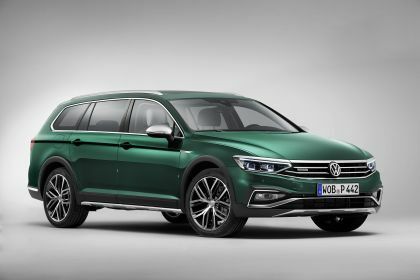 On this page you can find 34 high resolution pictures of the "2020 Volkswagen Passat Alltrack" for an overall amount of 111.40 MB. With the new Passat, Volkswagen We gathers more momentum. Volkswagen has developed a digital platform called Volkswagen We, offering and supplying bundled mobility products in a very simple manner. It offers an open system that is also continuously being enhanced. At this point, Volkswagen is therefore open to specialist partners and develops new services in conjunction with them. Collaboration with companies, authorities, as well as small, local start-ups creates space for new concepts such as We Park (cashless parking), or We Deliver (so-called car access-based services - simple and safe access of service partners to the vehicle). 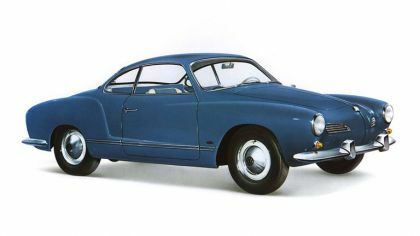 The Volkswagen ID is always at the heart of the system. It is central access to all Volkswagen services - and therefore also to a completely new spectrum of Internet-based information and services. 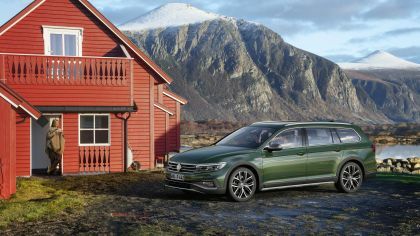 Volkswagen has fine-tuned the Passat's design for an even more commanding presence on the road in either saloon or estate form. 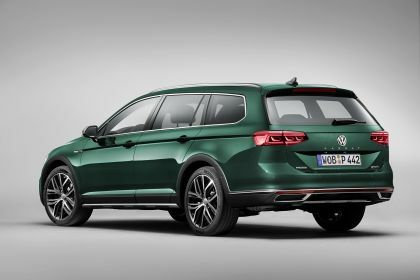 The front and rear bumpers, the radiator grille and the Passat logo, now located centrally at the rear, have all been redesigned. In addition, new LED headlights, LED daytime running lights, LED fog lights, and LED tail light clusters ensure a distinctive design. 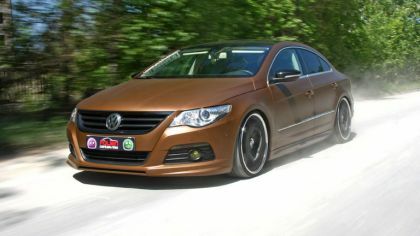 Colours like Lapiz Blue, Bottlegreen, and Sandgold are new to the Volkswagen Passat. In addition, four new styles of 17, 18, and 19-inch alloy wheels extend the wheel range. The Passat sets itself apart in the interior with new trim finishes and fabrics, redesigned door trims, a new trim colour, new instruments and a new steering wheel. There is a stylish backlit Passat logo in the dash panel instead of an analogue clock. The centre console has a large, open storage compartment with an optional inductive interface for smartphones and adjacent USB-C connection. The screens of the Digital Cockpit and the Infotainment systems merge at night with the illuminated buttons on the capacitive multifunction steering wheel and the background lighting - now optionally available in 30 colours - to create a well-lit, aesthetic and functional platform for providing information. 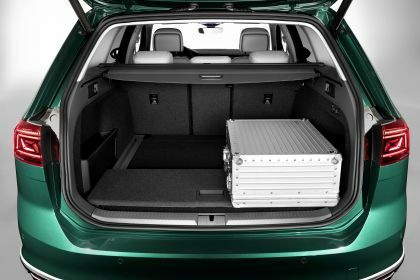 Danish hi-fi specialist Dynaudio has carefully adapted the 700-watt sound system to fit the interior of the new Volkswagen Passat perfectly. This ensures that the music on board - regardless of the source - has the best sound ever heard in a Passat. 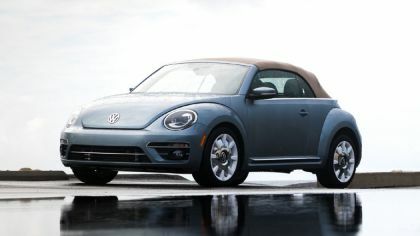 Volkswagen will offer the business class best-seller with a new specification structure. 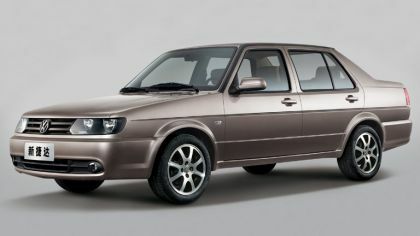 The basic equipment has the designation "Passat". Above this, the medium level profile is called Business. From now on, the top level is called Elegance. Business and Elegance can also be ordered with R-Line personalisation. 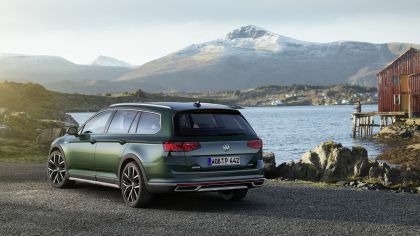 As well as these versions, the new model will also again be available as a separate Alltrack model (all-wheel drive all-rounder with offroad capabilities) and also as a GTE. 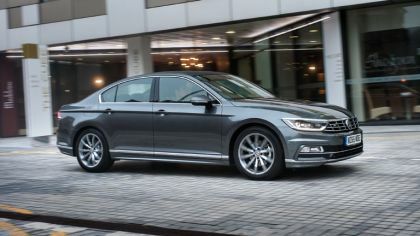 For the market launch, there will also be an exclusive special-edition model limited to 2,000 units: the all-wheel drive Volkswagen Passat R-Line Edition in the exclusive colour Moonstone Grey. On board here as standard: one of the two top engines (176 kW TDI or 200 kW TSI) and new assistance systems such as Travel Assist. The new Passat is a very cost-effective vehicle with low total operating costs. Indeed, the Volkswagen Passat is one of the most economical mid-size models with its high-production volume engines. Take the Passat 2.0 TDI SCR with 110 kW / 150 PS as an example: It has a cost of ownership of 17.3 ct/km - the lowest amongst its direct competitors. As well as the updated Volkswagen Passat, the new Volkswagen umbrella brand for assistance systems is also moving forwards: IQ.DRIVE. With IQ.DRIVE, Volkswagen bundles up the driver assistance systems of today and tomorrow on a path towards autonomous driving. The new Passat boasts the most advanced versions of IQ.DRIVE. The innovative network behind the systems makes the Volkswagen, which is tailored to the needs of high-mileage drivers, more comfortable and safer than ever before. The new assistance systems in the Passat include Travel Assist, Emergency Steering Assist, and ACC with predictive cruise control. The Travel Assist feature, which appears in a Volkswagen for the first time, allows for partially automated driving across practically the whole speed range up to 210 km/h - a milestone on the way to autonomous driving. An integral part of Travel Assist is the ACC with predictive speed control. The adaptive cruise control reacts to speed limits, towns, bends, roundabouts and junctions with corresponding speed adaptation. The IQ.DRIVE spectrum is supplemented by known technologies which are partially integrated in the new assistance systems. These include the lane change system Side Assist plus Rear Traffic Alert, the lane keeping system Lane Assist, Front Assist with Pedestrian Monitoring, the trailer manoeuvring system Trailer Assist, and the Park Assist system. If the driver no longer reacts for health reasons, Emergency Assist takes over. The system brakes the Passat to a standstill. 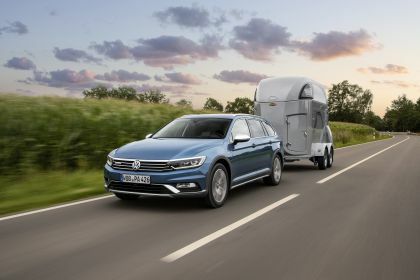 The use of Travel Assist in the new Passat is a world première. Like with the predecessor system Traffic Jam Assist, the adaptive cruise control ACC is responsible for longitudinal guidance in Travel Assist, while the Lane Assist adaptive lane guidance system handles lateral guidance Whereas this automatic longitudinal and lateral guidance system was only available up to a maximum of 60 km/h in connection with Traffic Jam Assist, the Travel Assist option in the new Volkswagen Passat enables partially automated driving up to 210 km/h. Travel Assist is activated via the multifunction steering wheel in a matter of seconds with a single button on the left-hand steering wheel clip. If Travel Assist is active, it enables partially automated driving on Level 2 of the spectrum of the official degrees of automation between 0 and 5. The driver must permanently monitor the system in Level 2 for legal and safety reasons. To ensure this, Travel Assist monitors whether the driver has hands on the steering wheel. This is more convenient in the new Passat than ever before as a direct result of the first capacitive steering wheel from Volkswagen. It is now sufficient that the driver merely touches the steering wheel; the capacitive surface recognises that the driver is still controlling the vehicle by means of 'hands-off detection'. In the past, feedback was required from the driver in the form of a slight movement of the steering wheel. Furthermore, the following applies: if the driver lets go of the steering wheel for more than around 10 seconds, then a series of warning signals (visual, acoustic, braking jolt) are issued. The driver must react by this point at the latest and touch the steering wheel, otherwise Emergency Assist is activated and the Passat is automatically brought to a stop. Volkswagen has considerably enhanced the electromechanical brake servo. The system, previously used only in the GTE with plug-in hybrid drive, can now be found across the whole product line as standard. This is a considerable improvement in comfort and safety. On the one hand, the electromechanical brake servo ensures that the Passat's brakes react even quicker. Furthermore, the new electromechanical brake servo also improves assisted driving - with tremendous benefits: Adaptive Cruise Control ACC reacts in a more effective manner, as braking interventions with the electromechanical brake servo can be controlled more precisely. In conjunction with Front Assist together with Pedestrian Monitoring, the braking distance can be shortened considerably within system limits. In an ideal scenario, the risk of an accident involving a pedestrian and the impact speed both fall considerably. The latest generation of adaptive cruise control - ACC - incorporates predictive cruise control. 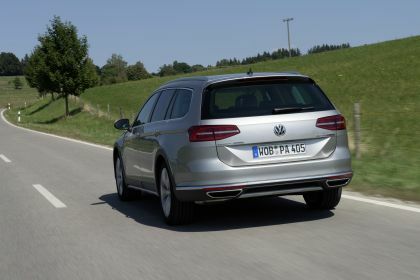 Up until now, the system in the Volkswagen Passat was a pure Adaptive Cruise Control system: just set the desired speed - braking and accelerating was then carried out by the Adaptive Cruise Control. This proven feature will also be offered in the new Passat. From now on, the new, predictive ACC will be available as an additional option. In combination with the navigation system and Dynamic Road Sign Display, the system can also react to variable parameters such as speed limits. ACC with predictive cruise control calculates the vehicle position based on the route and GPS data and reduces the vehicle speed before reaching bends, roundabouts, junctions, speed limits and towns. At the same time, ACC accesses the Dynamic Road Sign Display via the front camera (new generation MFK 3.0) and adjusts the speed as soon as a speed limit is detected. On leaving an area with reduced speed, ACC with predictive cruise control accelerates the Passat automatically until it reaches the maximum speed limit valid for a given section of road. The radar sensor from the current ACC takes over the safety function in the front and adapts the distance to the vehicle in front. 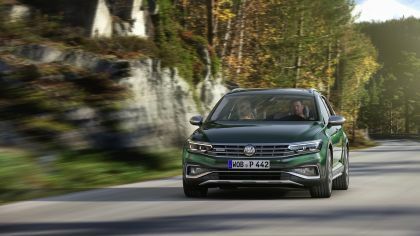 If the Passat is fitted with DSG, the ACC becomes a traffic jam and stop-and-go assistant, as the vehicle also moves off again automatically when equipped with the dual clutch gearbox . The latest generation ACC is no longer a passive system. Instead, it is an active system that improves convenience and safety. The driver can override the predictive ACC at any time by operating the accelerator pedal or brake. The Passat is offered with the Lane Assist lane keeping system as standard. The system correctively steers if the vehicle is about to leave the lane. Lane Assist recognises the relevant road lane markings using a camera that is integrated at the top of the windscreen. 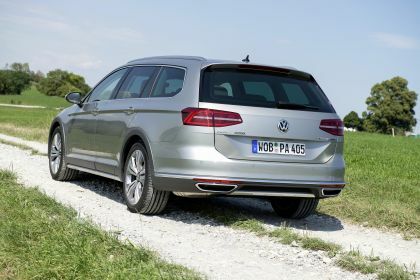 The new multifunction camera MFK 3.0 can be found in the Volkswagen Passat, via which lateral guidance is improved further. Background: the system can recognise both grass and the boundary lines of the lane via the newly integrated "Road Edge Recognition" system. The new Emergency Steering Assist in the Passat is available for the first time ever in a Volkswagen. It is automatically activated as soon as the driver has to avoid an obstacle. If the radar sensor integrated in the front end of the Passat recognises an obstacle, then the driver will be visually and acoustically warned about a collision. A typical example of such a situation is a vehicle driving on a country road before braking to a sudden stop. The driver behind intuitively carries out an evasive manoeuvre in response. Such evasion is more agile and controlled in the new Passat due to targeted braking intervention from the assistance system. The vehicle is also stabilised when quickly pulling back into lane and potential turning in is prevented within the system limits. The new Emergency Steering Assist enhances active safety on country roads and motorways. 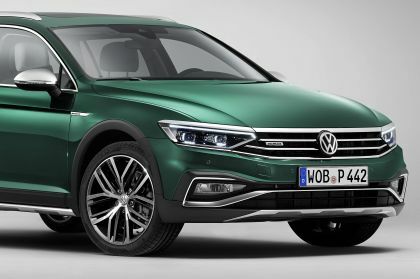 The Volkswagen Passat will be the second model after the current Touareg to be equipped with the new IQ.LIGHT - LED matrix headlights as optional equipment. Amongst other things, they impress with interactive light control that makes night driving more comfortable and safer. The LED headlights use a matrix made of light dots - individual LEDs that can be activated. Dipped beam and main beam are generated via two LED projection systems. The inner module has seven LEDs for basic illumination; an additional main beam is also realised via five additional LEDs. The outer module is the interactive LED matrix headlight - known as a pixel module. Its light is generated via a total of 32 individually controllable LEDs on a printed circuit. They form the LED matrix. The turn signal, daytime running light, and side light are also realised with LEDs. The LEDs on the turn signal with their "wiping" effect are arranged as a narrow horizontal stripe at the top within the headlight. If the turn signal is inactive then they form the daytime running light, supplemented by four additional LED elements that can be found in the LED projection systems. The LEDs in the daytime running light also form the side light when dimmed. The LED matrix system can be recognised by the IQ.LIGHT logo on the outside of the headlight housing. Various, partially interactive light functions are activated via a total of 44 LEDs in both projection systems. The responsible control unit uses signals from the front camera, the digital map data of the navigation system, the GPS signals, the steering angle as well as the current speed to precisely activate the individual LEDS for optimum light in fractions of a second. The driver activates the automatic continuous main beam function via Dynamic Light Assist by simply pushing the left-hand steering column switch forwards. The rest - dimming, main beam activation, city lighting, motorway light - is done by the Passat. Automatically. As the new matrix headlights operate with the highest light output, people, objects, other vehicles and animals are made visible that would be less recognisable and less visible previously with conventional headlight systems. LED technology is used for the new tail light clusters in the Passat as standard. The design and the LED contours give the rear area a distinctive night time light signature. In the top version of the full LED tail light clusters, the inner LED elements create six small angles known as wings. They are bordered by LED strips for the tail light (above, below, outside) and a LED strip for the turn signal (right at the top). The three wings for the tail light function are aligned with the longitudinal side facing downwards, and the three wings for the brake light face upwards. If the brake is actuated. then the three LED tail light wings switch off and the three LED brake lights switch on - resulting in a recognisable click-clack effect. 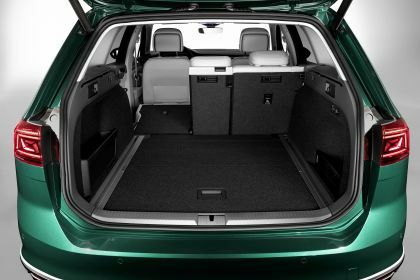 This feature was taken directly from the Touareg and is only provided by Volkswagen. As is the case with the LED matrix headlights, the LED tail light clusters in the top version are also equipped with a wiper function for the turn signals. Last, but not least, an animation as a coming home and leaving home scenario runs when opening and closing the Passat in the dark. To begin with, the turn signal starts by wiping twice in an in-and-out motion, then the three red LED tail light cluster wings are activated, followed by the red LED peripheral areas on the tail light clusters. All red LEDs then go out in succession after the animation has finished. LEDs are the preferred light source even in the basic variants. The dipped beam and main beam as well as the daytime running lights and side lights are realised with daylight white LEDs in the standard headlight. Furthermore, the combined fog and cornering light in the bumper optimises visibility using LED technology. The tail light clusters at the rear are equipped exclusively with LEDs. Volkswagen has largely digitalised the world of operation and information in the new VW Passat as the first brand model to be fitted with the third generation of the Modular Infotainment Matrix (MIB3). At the same time, the Passat also features the latest development stage of the Digital Cockpit; the digital instruments and the Infotainment systems of the MIB3 are merged into a new unit. The MIB3 systems in the Passat are also "always on" - because they are equipped with their own SIM card. 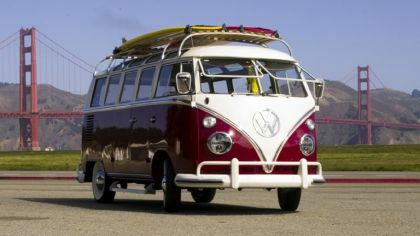 This online connectivity unit (OCU) is the interface to Volkswagen We for the vehicle and all passengers on board - a new Internet-based world of mobility with numerous online services as standard. The third generation of the Modular Infotainment Matrix (MIB3) was enhanced in several areas. Three Infotainment systems will be available at the model launch: Composition Media (6.5 inch, no navigation), Discover Media (8.0 inch, first navigation system level) and Discover Pro (9.2 inch, maximum navigation system level). The most important distinguishing feature compared to the MIB2 is the online connectivity unit (OCU) including integrated SIM card. This means the Volkswagen Passat is permanently online as soon as the driver has registered it in the Volkswagen system. This is shown in the display by a small globe, which changes colour as soon as the system is live. The OCU has several advantages. For instance, it is now generally possible to access the online services in We Connect as well as streaming services for music without a paired smartphone or an additional installed SIM card. Online radio stations will be available via radio.net in addition to FM, AM, and DAB stations.Passengers can also connect their smartphone, tablet, e-book reader, or similar devices to the Internet via a Wi-Fi hotspot. Natural voice control is also available in the Passat thanks to the online connection. Important for business users: if a smartphone is paired, text messages can be dictated and received messages are also read out by the Infotainment system. App-Connect - which permits use of various smartphone apps via the Infotainment system - can also be activated wirelessly via Bluetooth for the first time with Apple iPhones. Apple CarPlay™ is therefore practically automatically active. Compatible smartphones are charged inductively via a new storage compartment with interface for mobile telephone in the centre console. "Hello Volkswagen" - this short call is sufficient for the Passat to respond to natural spoken commands. With "Yes, please?" the Passat answers that it is ready. All major features for navigation, telephone, and radio can be operated using speech. For example, it is sufficient to say "I'd like to go to Jungfernstieg in Hamburg" to activate the corresponding route guidance. This is possible because the signals entered via speech are processed and recognised via a cloud; voice control naturally also works in a simpler mode when offline. Thanks to the online connection, both the driver and passengers can access up-to-date information, destinations, and intelligent navigation via voice command. Inputs are as intuitive as you would expect from current devices in the consumer sector and from smartphones. The intuitively controllable menu navigation in the Infotainment system was redeveloped and partially rebuilt. With the Discover Pro system, for example, the driver can control practically all features of the Infotainment system on two clear levels via a reconfigured Home screen. The driver simply configures the desired selection and arrangement of functions - just like the apps on the screen of a smartphone. That's it. 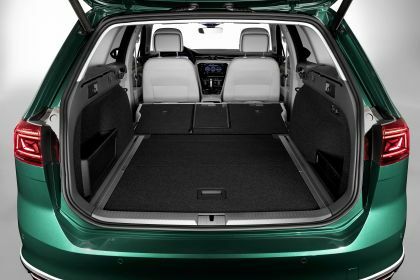 This means operating the Volkswagen Passat is simpler than ever before. At this point, Volkswagen has transferred more new technologies from the Touareg to the Passat, as the design of the screen interface was taken from the latest top SUV model. The navigation menu has also been reconfigured. The primary goal was to design a menu which is as intuitive as possible. For this reason, there are now four small symbols on the left-hand side that the driver can access, Destination Import, Last Destinations, Trip Overview (interactive map), and Favourites (stored destinations). The Trip Overview is a completely new feature: When the navigation system is activated and the map view is fully opened, a stylised route (vertical bar) can be seen on the left-hand side as a trip overview. The traffic flow and the points of interest (POI) are shown via online traffic data along with any expected delays as a result. If the driver touches on a POI - such as a restaurant - then relevant details are shown. It is possible from the POI display, for example, to directly call to reserve a table. Layout 1 / Dials: RPM (left) and speed (right) are shown interactively in round instruments. Information fields can be freely configured within the dials. An individually customisable display is shown in the middle between the rev counter and speedometer. Layout 2 / information fields. The driver can click the View button to change to a digital view without dials and with configurable information fields. A freely customisable display is integrated in the middle once again. Layout 3 / Display with a function. Another click means the map is shown across the whole display. Information such as the speed is shown at the bottom of the screen. In recording studios and living rooms across the world, Danish hi-fi specialist Dynaudio ensures that music sounds precisely how it was recorded. That's why, for example, the Touareg, Arteon, and also the previous Passat optionally have Dynaudio sound systems. The sound system was refined even further to best suit the interior of the new Volkswagen Passat. The result: sound of exceptional quality. The Dynaudio Confidence system uses twelve loudspeakers to transmit even the finest nuances into the vehicle interior. The 700-watt total output of the 16-channel amplifier ensures a dynamic effect that faithfully reproduces rock, jazz, and classical music. The sound can be refined further via the Authentic, Soft, Dynamic, and Speech sound sets as well as the integrated equaliser. Mobility is rapidly changing. It is becoming more networked, service-oriented, personalised, and increasingly puts the focus on people. The new Passat sets standards in this regard: thanks to the third generation Modular Infotainment Matrix (MIB3), it offers new hardware and software as an online interface to the interactive world of information and service offerings. The company's latest development - Volkswagen We - is a digital platform that offers and supplies bundled mobility products in a simple manner. It is an open system that is continuously being enhanced. As an entire ecosystem, Volkswagen We combines different areas of use: in and on the vehicle, between the vehicle and smartphone, and in the interaction between vehicles and users and the world of information and offers in which they all move. 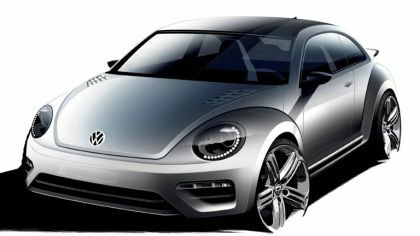 After one-time registration with Volkswagen We, each customer receives a Volkswagen ID. The Passat driver can, for example, access services from the vehicle such as the cashless parking service We Park. Data plans for use of various online services or the Wi-Fi hotspot can be booked and naturally also renewed via the Infotainment system. These are provided by the Volkswagen mobile phone partner Cubic Telekom - an innovative technology start-up from Dublin. The same approach can be used in this In-Car Shop to download apps such as We Park in order to use them as an extended feature of the Infotainment system in the future. App updates will also offered for download later on. An ever-increasing range of online services is covered via We Connect. Volkswagen Passat offers We Connect as standard equipment. We Connect Plus is offered as an optional premium package with even more options. For companies with their own fleets or the self-employed, Volkswagen has also developed We Connect Fleet - including features such as a Digital Logbook, fuel consumption monitoring, Service Manager or the ability to save location histories, saving both time and money. Together with We Connect, the smartphone becomes a remote control and a mobile information centre. Locking the car from a distance with the smartphone, accessing vehicle information such as the remaining range, or locating your car or the vehicles in a fleet - all can be done via smartphone. No matter whether We Connect, We Connect Plus, or We Connect Fleet: the user sets up access to all services and information within this networked architecture just once via their own Volkswagen ID. This gives the user access to all conceivable online services. With the Volkswagen ID, the user can even be identified in future in a different vehicle via cloud-based personalisation. The Passat will automatically activate many personal settings in this case. The smartphone will become the vehicle key in the future. We Connect is the interface for this today in the new Passat. The smartphone is set up for this purpose via the We Connect app, then authorised via the Infotainment system and TAN. The Mobile Key will be compatible with Android-based Samsung devices. No mobile network connection is required to use the smartphone as a mobile key. It is sufficient to place the smartphone near the door handle in the same way as the keyless locking and starting system Keyless Access opens the Passat. To start the engine, the smartphone is placed in the new compartment with interface in front of the Volkswagen Passat's gear knob. Furthermore, it is also possible to send the mobile key to friends or family so that they can also use their smartphone as a key for the car. We Connect in the new Passat changes the face of day-to-day mobility. The We Park online service, for example, means there's no need to fill a parking meter with coins after finding a parking space. We Park in the new Passat handles payment of parking fees for the first time directly via the Infotainment system. As a result, the Passat has the parking meter on board. This is also the case with the We Park app. Parking fees are calculated to the minute and cent on a monthly and cashless basis. Traffic wardens can recognise participation in this online service via the registration number and the We Park sticker. If the parking time is running out, then the We Park app issues an early reminder. It also shows where the vehicle is parked.The navigation system in the Volkswagen Passat or the app also help in finding parking zones that are compatible with We Park. An increasing number of German cities are taking part. The first Dutch cities are also getting involved. With new services such as We Deliver, the luggage compartment becomes a mobile delivery address - a portable post office box. This means, for example, that ironed shirts from the dry cleaners (Jonny Fresh as service provider), flowers from the florist, or purchases from a delivery service can all be delivered there. 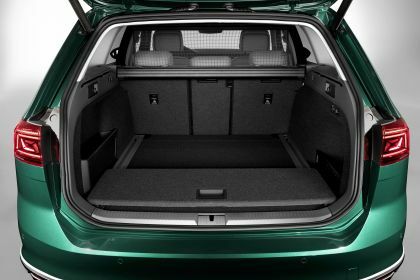 Access to the luggage compartment and GPS data for locating the Passat is obtained temporarily by We Deliver service providers for a delivery. In the same way, it is now possible for the Passat to be cleaned at its location by a service provider (My Cleaner) to save time going to the nearest car wash.
Volkswagen We is looking forward to working with large or smaller local partners who want to develop new offers. And this is just the start. 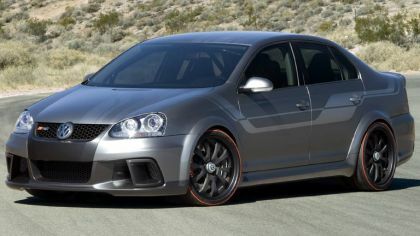 Volkswagen We has the potential with the large volume of the Passat and other best-sellers in this class to attract an ever-increasing number of partners. The future We Experience service will demonstrate that the past analogue and future digital worlds can fuse to create a new present. We Experience is implemented in the Infotainment system, and it provides tips such as customised options for restaurants, shops, or filling stations along the route upon request. 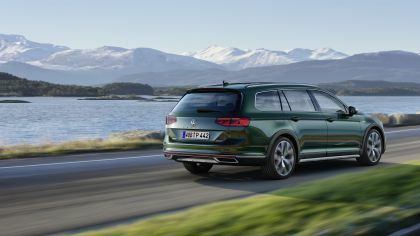 Volkswagen will launch the new Passat GTE with an enhanced plug-in hybrid drive as both saloon and estate models. The combination of electric motor and petrol engine brings great benefits: On the one hand, the GTE models with their combination of electric drive motor and efficient turbocharged petrol engine (160 kW / 218 PS system power) provide the benefits of a long-distance vehicle. On the other, they can be used as a zero-emission vehicle in the urban environment. 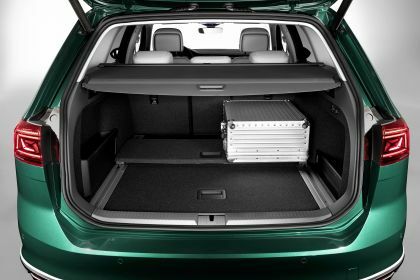 With the new Passat, this now works even more impressively because the new GTE is equipped with an even larger battery. The battery's energy content has been increased from 9.9 kWh to 13.0 kWh - a plus of 31 per cent. The pure electric range was thus extended correspondingly. This is now up to approx. 55 km in the new, realistic WLTP cycle; this is equivalent to a range of around 70 km in the old cycle (NEDC) (20 km more than the predecessor). In addition, a new operating mode configuration has made it much easier to reserve sufficient battery capacity for the target destination in a city. 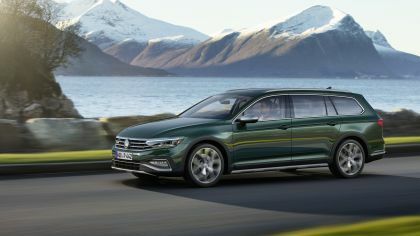 The plug-in hybrid drive is recommended for most commuters as the ideal engine and the Volkswagen Passat GTE can be used as a zero-emission vehicle in a targeted manner in urban areas and can therefore be exempt from road tolls in major cities such as London (congestion charge). 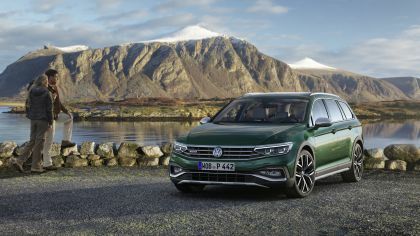 The two previous modes Battery Hold (maintaining battery charge level) and Battery Charge (charge battery via TSI) were integrated into the Hybrid mode in the new Volkswagen Passat GTE. The driver selects the Driving Mode menu via the Infotainment system to charge the battery during the journey. E-MODE and Hybrid modes are available for selection here. If the driver selects the Hybrid field, a battery with ten scale steps is shown together with an equals sign ("=") as well as arrows pointing upwards ("Ù") or downwards ("Ú"). If the driver selects "=", the battery's energy level is maintained at the same level; if they select "Ù" then the battery is charged via TSI and recuperation to the selected level on the scale; if they select "Ú" then the battery can be used until it falls to the minimum level. The Passat GTE is equipped with a 3.6 kW battery charger. When connected to a conventional electrical grid with 230 volts / 2.3 kW, the battery - if completely empty - will be fully charged within six hours and 15 minutes. The charging time falls to four hours with a wall box or a charging station with 360 volts / 3.6 kW. Charging starts with connecting the plug. Delayed charging is another available option. The time delay can be set using either the Infotainment system or an app. The charging process can also be activated directly via the app - in much the same way as a remote control. In addition to the charging process, the temperature inside the vehicle can be raised or lowered - depending on the temperature outside - via the time pre-set function. The new Passat GTE is powered by a turbocharged stratified injection engine (1.4 TSI) and an electric motor. This TSI engine delivers 115 kW / 156 PS. The electric motor generates precisely 85kW / 115 PS. The new high-voltage battery - located in the vehicle floor in front of the rear axle - supplies the electric motor with power. 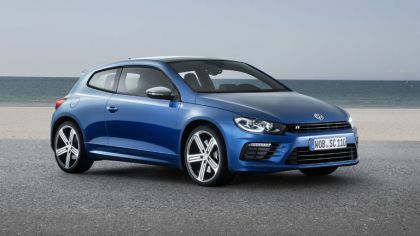 For power transmission, the Volkswagen is equipped with an automatic 6-speed dual-clutch gearbox (DQ400E) developed especially for use in hybrid vehicles. Other components of the hybrid drive include power electronics (this converts the battery's direct current into alternating current for the electric motor) and the battery charger. The all-wheel-drive Volkswagen Passat Alltrack is a further independent model version. 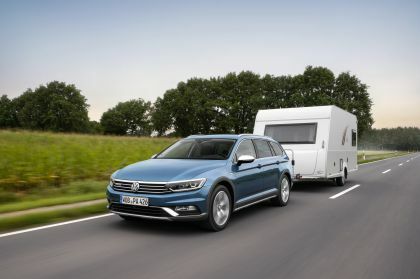 This was developed for private and business high-mileage drivers who do not just drive the Passat on surfaced roads, who want to hitch a trailer to it or who also value the perfect grip when on a skiing holiday. 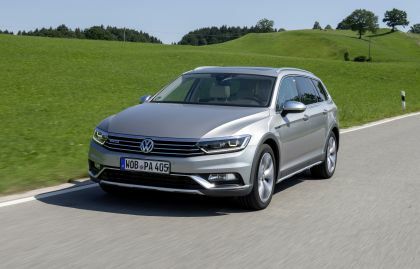 A progressive all-rounder that comes into its own when the going gets tough on the basis of the Volkswagen Passat Estate - a crossover from the estate and SUV models. 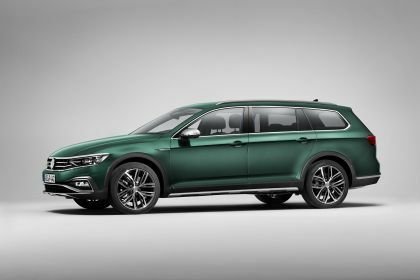 The standard specification of the Passat Alltrack includes bumpers adapted for offroad driving with underbody protection, sill extensions also featuring underbody protection, and robust wheel arch extensions. 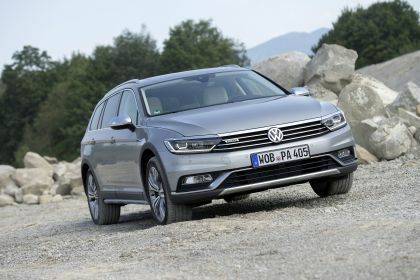 Thanks to a special Offroad mode, modified running gear with greater ground clearance (172 mm) and the permanent 4MOTION all-wheel drive, the Passat Alltrack is just as much at home when driving offroad on terrain otherwise reserved for SUVs. 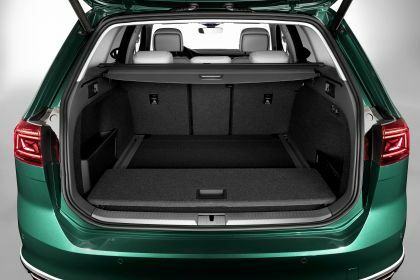 At the same time, the Volkswagen Passat Alltrack is also a comfortable and fast touring car. 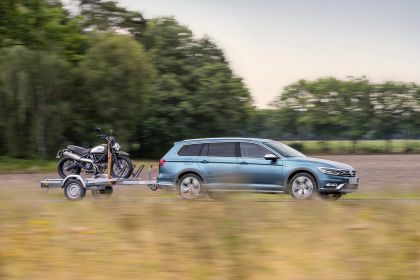 The Passat Alltrack is available with a 2.0 TSI petrol engine with 200 kW / 272 PS or a choice of two TDI diesel engines with 140 kW / 190 PS and 176 kW / 240 PS respectively. A 7-speed dual clutch gearbox (DSG) is standard for all variants. The new Volkswagen Passat is again optionally available with the adaptive chassis control DCC (standard for some engine variants). The DCC system has also been further developed so that drivers can more individually customise the system to their personal driving style and comfort requirements. The newly tuned dampers can now also be continuously configured over an extended range - in parallel to the familiar settings ("Comfort", "Normal," and "Sport"). Using a slider, it is possible to set a personalised DCC mode individually and precisely over the whole range and then save this. Intermediate settings are therefore now also possible as a result. 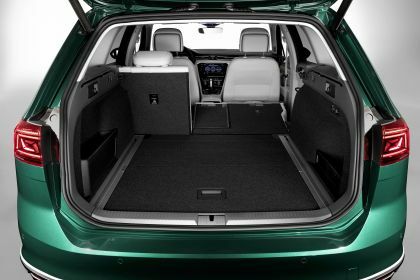 The known adjustment range is supplemented with new levels: the vehicle body is decoupled to its maximum extent below Comfort and vehicle comfort is enhanced further. Above Sport, there is an extended range with maximum damping for minimised body movement and particularly direct vehicle reactions.